Hey now! This is pretty cool! 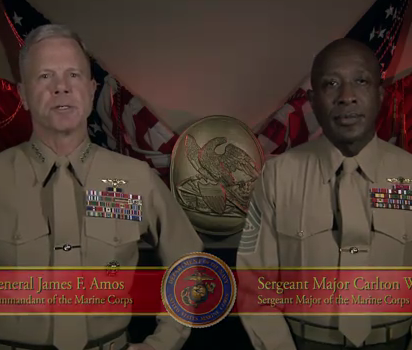 Marine Chief Genereal James Amos and Sergeant Major Carlton Kent have released this video ushering in a new wave of equality in the United States Armed Forces. You might recall Gen. Amos testifying to the Senate that repealing Don’t Ask Don’t Tell would be a mistake, he agreed to fall in line if the repeal moved forward, which is obviously has. Three months of diversity preparedness training are set to begin in all four branches of the U.S. military starting February 4. It’s like an extended field trip! Or maybe more like three months of health class? Ech! We always hated that time of the school year. It’s inspiring to see the military moving forward with this. RIP DADT. Long live the queens! Are you proud to see the Marines welcoming diversity and honesty into their ranks?